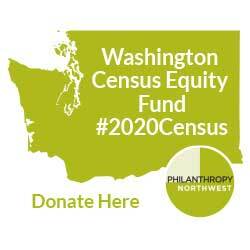 Philanthropy Northwest supports a robust and accurate census count, and actively calls upon state and federal governments to fully fund the 2020 Census. We also encourage the philanthropic sector to assume an advocacy role in preparing Northwest communities for the census. The census is a constitutionally required, once-a-decade count of every person living in the United States. The census provides indispensable population data that is critical to our democracy for several reasons, including fair political representation, equitable allocation of more than $800 billion in federal funding to states, and informed decision-making by policy makers, businesses and organizations. Historically, the census has disproportionately undercounted certain communities – people of color, including Native communities on and off tribal lands; immigrants; populations with limited English proficiency; urban and rural low-income households; and young children. A census undercount increases inequality in political representation and reduces funding to states and localities for critical services and programs that support communities’ safety, health and well-being. Unfortunately, the 2020 Census is facing unprecedented challenges, which heighten the risk that this census will fail to count every person. These challenges include underfunding of the U.S. Census Bureau, delayed IT systems – ahead of the first census that will rely primarily on internet responses, and decreased public trust in reporting information to the government. Read more about the challenges and what's at stake for the 2020 Census. The philanthropic sector relies on census data to guide the reach, impact and effectiveness of its investments. Philanthropic leaders use census data to understand community and demographic trends and inform fact-based decisions on efforts to fund. Inaccurate census data could divert federal resources from communities in need, forcing philanthropy to fill these gaps, while decreasing the effectiveness of these investments. United Philanthropy Forum, the national network of philanthropy-serving organizations (PSOs), including Philanthropy Northwest, is a resource for information and opportunities to engage PSOs across different regions on the 2020 Census. Funders Census Initiative (FCI) 2020, based out of the Funders’ Committee for Civic Participation, supports grantmakers by providing forums to learn and strategize together; developing resources to inform funders’ work, including a Funders’ Toolkit; and monitoring policy developments that could impact the 2020 count. Philanthropy Northwest is a member of the FCI leadership team. Your foundation can join the FCI working group to connect with hundreds of funders nationwide and gain access to additional resources and programming. Census Counts 2020, a collaborative campaign led by The Leadership Conference Education Fund, is working in more than 30 states and partnering with national organizations and stakeholders invested in a fair and accurate 2020 Census. Census Counts 2020 hosts a clearinghouse of fact sheets, updates and resources for stakeholders from all sectors. Philanthropy Northwest supports members’ census efforts across our region through a variety of activities, including programming (convening events, webinars and meetings); participating in state working groups of funders and community partners; connecting funders to 2020 Census funding opportunities and resources, peers and experts across the region and nation; supporting outreach around advocacy opportunities; and developing state-level factsheets and tools. Learn about the latest Philanthropy Northwest census efforts and new opportunities for funders in our region. We encourage Philanthropy Northwest members to keep us updated about efforts in your states. Please contact Meredith Higashi to share your updates or learn more about census work and resources across the Northwest.